This Sony HX90V review shows a camera that has quite a few desirable features on the outside that are easy to see: A 30X optical zoom lens, a pop-up viewfinder, and an articulated LCD. But it's the primary feature on the inside -- a small image sensor that struggles in low light conditions -- that means this Sony camera lags behind others in its price range in terms of image quality. With a retail price near $500, we'd expect the HX90V to excel in terms of image quality in all types of lighting conditions. And while this camera does a solid job creating photographs when you're shooting in sunlight and excellent lighting conditions, its low light performance results in well below average results. 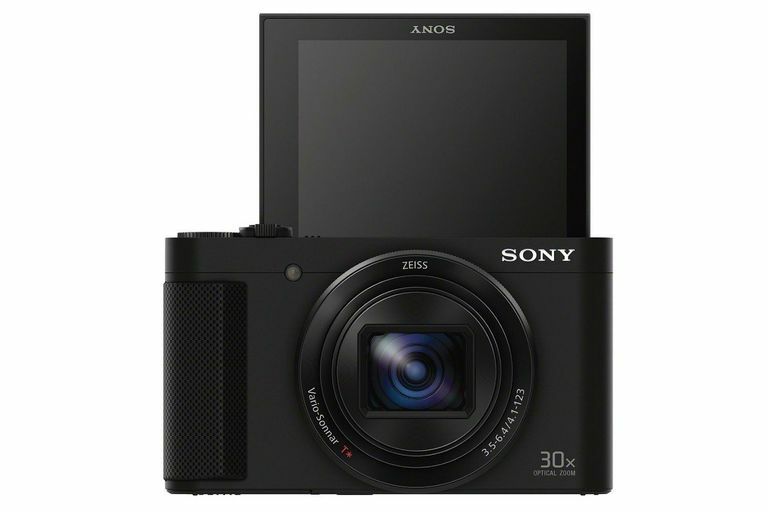 Part of the problem for this Sony fixed lens camera is that it contains a small 1/2.3-inch image sensor, which is the smallest physical image sensor that you'll find in a camera, and it's commonly found in cameras that cost less than $200. The image sensor is so important in terms of determining the image quality you can create that this deficiency in the HX90V is impossible for us to overlook. If you're looking for the best travel camera option, this is where the Sony HX90V could become a successful model. If you're planning to shoot most of your photos outdoors while on the trip, such as landmarks and nature scenes (and avoiding low light scenes), then this model's image quality will be more than good enough. The HX90V's 30X optical zoom lens will serve you well for these types of photos, and the small camera body will be easy to carry. To further expand on the image quality issues mentioned earlier, the Sony HX90V's low light problems primarily revolve around its inability to keep noise out of the final image. When image sensors struggle with low light conditions, they generate noise (or stray, incorrect pixels), which detract from image quality, making the photograph appear to be less sharp. Noise tends to appear in photographs when you increase the camera's ISO setting beyond what the image sensor can normally handle. (Each camera has an ISO range that you can use; increasing the ISO setting makes the image sensor more sensitive to light.) For most cameras, a high ISO setting causes excessive noise, while low and mid-range ISO settings don't. With the Sony HX90V, which has an available ISO range of 80 to 12,800, even mid-range ISO settings create noticeable noise, which is a significant drawback for a camera in this price range. The HX90V offers 18.2 megapixels of resolution in its 1/2.3-inch image sensor. Sony gave this camera built-in Wi-Fi, NFC, and GPS wireless connectivity, which is especially helpful for those who are engaging in photography while traveling. And because the HX90V has a stronger battery life than average for a thin camera, you can use these wireless connectivity options a bit more freely than you can with a thin camera with poor battery life, where the Wi-Fi connection will drain the battery very quickly. The maximum aperture setting for the HX90V's built-in lens is f/3.5, which isn't quite as good as we'd like to see in this price range. This means you won't be able to shoot photos with an extremely shallow depth of field, which is a desirable attribute for shooting portrait photos. Then again, this camera is a much better candidate for shooting general photos and long-range nature photos -- thanks to its 30X optical zoom lens -- than portrait photos anyway. The Sony HX90V's design is where this model outshines the competition. We especially liked the electronic viewfinder that pops out of the top of the camera body, giving you the option of using either the viewfinder or the LCD screen to frame photos. One of the biggest complaints we hear from readers about digital cameras is the lack of a viewfinder (which, of course, were available on all film cameras). So having a viewfinder that can rise and compress into a digital camera body is a great feature. If you'd prefer to stick with the LCD screen to frame photos, this Sony model has an impressive screen. It measures 3 inches diagonally and includes 921,000 pixels of resolution to provide sharp pictures. The screen is able to swivel at up to 180 degrees, allowing you to shoot selfies with this camera. And then there's the powerful 30X optical zoom lens, which is rarely found in a camera that measures just 1.39 inches in thickness and can fit in a large pocket. Having such a large zoom range makes the HX90V a versatile camera, meaning it will work well in numerous different shooting situations... as long as you don't count on it to create sharp photos in low light conditions.